Net-a-Porter is seriously a dangerous place to be at the moment. Each time I look at their sale, I spot something really nice like this pair of Chloé leather sandals Lucy from Fashion Me Now has been raving about. The thing for me is first, I hate clutter in the house. So I’m not going to get X amounts of paires of shoes just because they are in the sale. Secondly, I think now I have found the style that works for my figure and age, I want to get something that is really ME and I will wear as much as I wear my Isabel Marant pieces. Granted it took me a few months to get a pair of Stan Smith (they are 20% OFF on Zalando) but it turned out to be a good purchase (for me!) as I wear them weekly. One thing that I have really loved recently is clothes with 3/4 sleeves like my oversized coat from Monki (available on Asos). Funnily enough, I first spotted this coat on my friend Catherine. Catherine is 1.70m and the coat looked perfect on her. I wasn’t sure it would fit my 1.55m but it was love at first sight. I had never heard of Monki before and when I found a shop, it’s definitively not a shop I would have stepped in before. It felt like a 70s nightclub with lots of mirrors, a bit too wacky and youngish but then I found the coat and luckily the last size available was mine and it fitted me perfectly, job done! 1/ I think 3/4 sleeves coats look incredibly stylish and feminine which is why I’m loving this coat (40% OFF) by The Row (featured above). This cream coat from Mango looks great too (although I would call this more a jacket rather than a coat). 2/ OK bags, shoes are my weaknesses more than jewellery. I think you can wear as much as high-street as you want, if you accessorise with the right shoes and bags, you’re on and this handbag from Marni is timeless and at 60% OFF, it makes it the perfect investment piece. I also love this clutch from Clare Vivier (who doesn’t!? ), this Jérôme Dreyfuss fringed bag and Alexander MacQueen leopard shoulder bag and this black fringed bag from Miu-Miu. 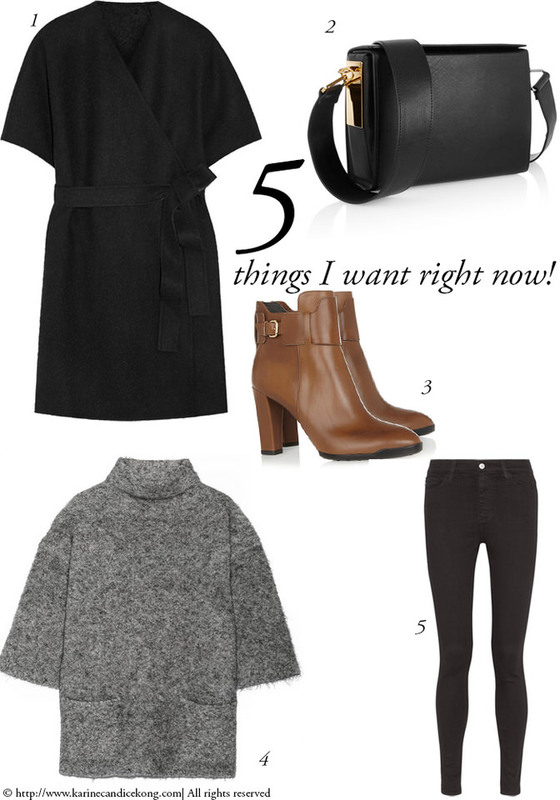 4/ I’m still loving this Lanah sweater which I had featured last year in my 5 Things I want right now and it’s now 50% OFF so defo one to get. This cashmere blend sweater (30% OFF) by Helmut Lang feels incredibly comfy and this metallic sweater is great to jazz up a pair of black trousers. 5/and finally this skinny jeans by Alexa Chung for AG Jeans. You have to be extra careful, haha! I’ve actually just bought some Superstars, they’re really neat!